The Nigerian Export Promotion Council (NEPC) was established to promote non-oil exports in Nigeria in order to diversify the economy away from oil and make it a formidable one. However, it stands to reason that this can only be achieved by operating a system in the Council that is free from all forms of corruption, hence, boosting the confidence of the international community on products and companies it promotes. 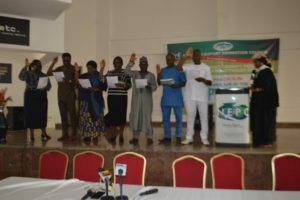 This, therefore, is the underlying objective and main thrust of the recent inauguration of new members of the Anti-Corruption and Transparency Unit (ACTU) of NEPC in Abuja by the Independent Corrupt Practices and Other Related Offences Commission (ICPC). The goal is to ensure transparency and accountability in the operations and practices of the Council. The Unit, amongst other duties, is mandated to carry out staff sensitization on and against bribery and corruption, and to serve as an internal check mechanism for propelling the Council towards achieving its goal of promoting non-oil exports as the key driver of the economy for the overall growth and developmental objectives of Nigeria. Speaking during the inauguration ceremony, ICPC’s Chairman, Professor Bolaji Owasanoye, who was represented by Justin Kuatsea of Corruption Monitoring and Evaluation Department, emphasized the importance of ACTUs, saying that they were neither spies nor police, but would work closely with the management of NEPC to promote professionalism, probity and accountability in the operations of the organisation. Professor Owasanoye also highlighted some of the duties of the units, such as the examination of systems, processes and procedures that are prone to corruption; proffering solutions, and ensuring compliance as well as preliminary investigation into complaints and reports. Addressing a cross-section of press immediately after the inauguration, the Executive Director and Chief Executive Officer of the Council, Mr. Olusegun Awolowo, reiterated the importance of ACTU in his organization, saying that it will guide both staff and management not to engage in corrupt acts. He noted that as an export promotion organization, the Council must not be found wanting. “We are an export promoting organization because we showcase companies with good standards and good products to the international community. We ourselves must not be found wanting. If we are in full compliance with the laws of the land, the world will have full confidence in us and with that confidence reposed in us, we then can promote Nigerian companies successfully,” Mr. Awolowo explained. In his acceptance speech, the chairman of the newly inaugurated members of ACTU, Mr. Saave Nanakaan, promised to uphold the ideals of ACTU in the course of his duties. The high point of the ceremony was the administration of the oath of allegiance on the inductees.